I used to not really like salmon, or most fish for that matter. I don’t know why, all I can say is that it tended to taste too fishy!! Yes, that sounds ridiculous, but never mind. The smell also had something to do with it, and the texture, and the bones and also being presented with a plate with beady eyes peeping up at you. So not too many reasons! I still have a few issues with some seafood – more to do with the slimy (and rubbery) texture of things like oysters, mussels etc – they’re just strange and I don’t see how you can get enjoyment out of them, it does put me off a little bit. However, I’ve now seen the light and realised that eating a fillet of fish is so light and really refreshing, that I’m not sure why I had such a dislike of it. I guess your taste buds change as you get older – for example I now love wine, which wasn’t top of my list of things to drink when I was younger! We invited my brother and his wife over for New Year’s Eve and I decided I’d go all out with the food. My sister-in-law is a veggie (but eats fish) so we thought a fish dish would be a good option as the men wouldn’t have liked just eating vegetables! 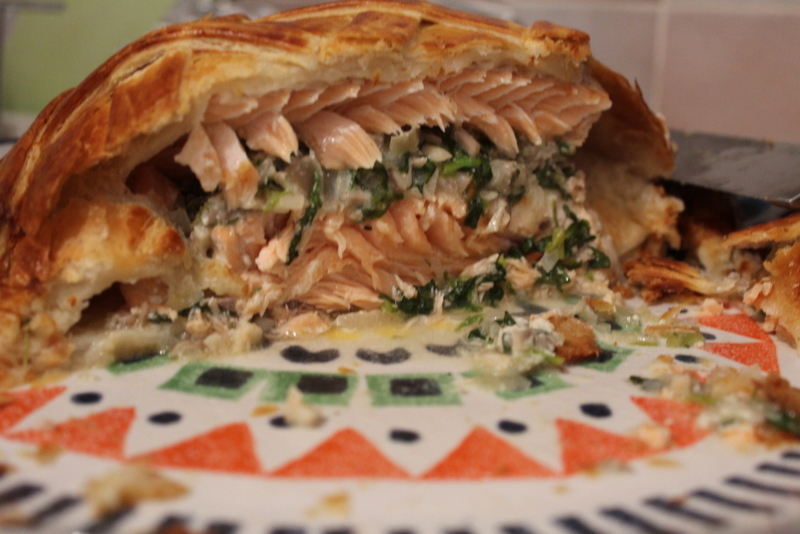 I have to admit that I don’t cook fish very often (mainly because I don’t really know what I’m doing with it) so making a salmon en croute seemed like a good challenge, and the photos in the recipe book made it look sooooo delicious! Yet again, the recipe is from my cooking hero, Mary Berry, from her latest book ‘Mary Berry Cooks the Perfect’ which we were given as a wedding pressie. It’s a fab book and does provide a great step by step guide on how to get things, well, perfect! I haven’t included all the additional detailed tips/steps from the recipe book, so you’ll have to buy the book for the full recipe. I have to say I was very impressed with the result and the watercress sauce was DELICIOUS and would work really well as an accompaniment to other fish dishes. It is definitely a great dish to do for a dinner party – looks very posh and tastes yummy. The other bonus was that it served 8 and there were only 4 of us so we got to eat the leftovers the next night! Perfect. Heat 2 tbsp oil in a large, not-stick frying pan. Add shallots and fry over medium heat for 3-4 mins or until softened, stirring occasionally. Increase the heat, stir in the mushrooms and garlic and fry for 4-5 mins or until liquid has evaporated. Add the lemon juice. Take pan off heat and mix in watercress until wilted. Season, transfer to a bowl and leave to cool, then stir in crème fraiche. Roll out half the pastry onto a lightly floured surface. Trim to a rectangle 5cm larger all round than the salmon. Wrap pastry trimmings in cling film and set aside. Place out rolled out pastry onto large piece of baking paper. Lay one of the fillets in the middle of the pastry. Season and spread with horseradish sauce, then the mushroom/watercress mixture. After tasting it, I personally think it needed more horseradish sauce as it wasn’t really noticeable, so you might want to try 1.5-2 tbsp depending on your personal taste. Lay other fillet on top and season. Roll out remaining pastry so it’s about 7.5cm wider and 5cm longer than the bottom pastry layer. Brush edge of bottom layer with beaten egg. Lay the pastry over the salmon and trim off excess to give 2cm edge all round. Press, score and crimp the edges. Re-roll pastry trimmings and cut into strips. 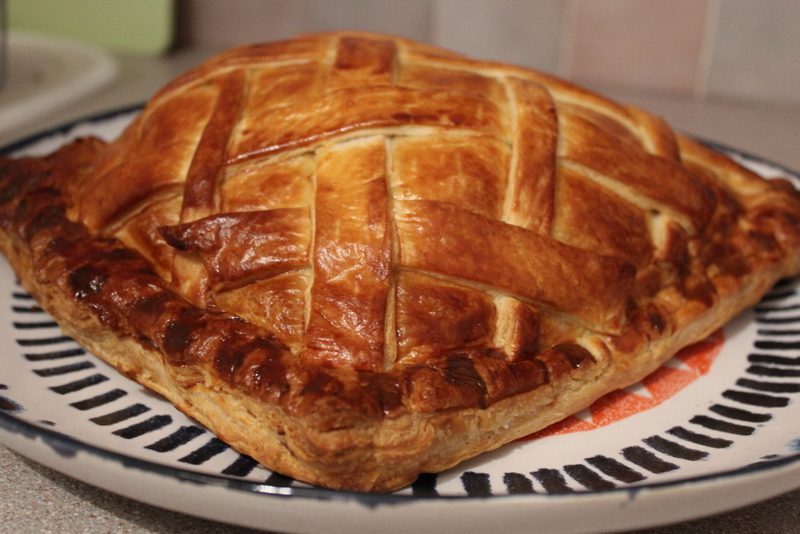 Brush the croute with egg, lay strips over top in criss-cross pattern to decorate and brush these with egg. Lift on to large baking sheet with baking paper still underneath. At this point you can put in fridge to chill until you need it (should be cooked same day though). Bake for 30 mins or until golden brown. Recommend checking after 20 mins and if too brown, cover with foil for last 10 mins. Melt butter in medium pan. Stir in shallot and fry for 2-3 mins or until soft, but not browned. Stir in the flour and cook for 1 minute. Take pan off heat and slowly stir in stock. Return pan to medium-high heat, and cook until sauce has thickened slightly. Add peas and simmer for 2 mins. Remove pan from heat, stir in watercress. Puree until smooth and set aside. When croute is done, remove from oven and leave to rest for 10 mins. Whilst it’s resting, stir the crème fraiche and mint into the sauce, season, and reheat. Serve up and wait for the applause!! pastry was originally a flour and water dough ‘paste’ invented by the Romans and was wrapped around meat before roasting. It wasn’t intended to be eaten, just used to retain meat juices and aroma. This looks great! Mary Berry’s recipes are always so good!